I’ve kept three flavours of freshwater spiny eels to date and wanted to share my experiences with those who are considering adding an eel to their freshwater aquarium. 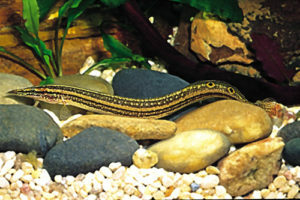 The three types of eel I have cared for are Fire Eels, Peacock Spiny Eels and Half Banded Spiny Eels. I have to be honest, Fire Eels freak me out somewhat. I suppose this is considering how large they can actually grow (over a meter). I saw a full-sized one once that looked more like an Anaconda than a fish. So be warned, Fire Eels can grow very large. They are also aggressive eaters with quite an appetite. Any morsel-sized fish that are in your tank will soon disappear – especially newly added fish. Fire Eels also produce a lot of waste when well-fed. On the plus side I found my fire eel to be very active and not at all shy. You can begin hand-feeding it in a matter of days and they’ll come right to the surface to beg like other fish may do. It is also important to note that fire eels are mostly active at night and love to burrow. In other words he/she may keep you up at night with incessant burrowing and will most likely leave your decorations and plants uprooted. 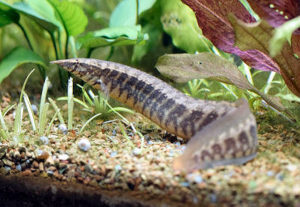 I find these spiny eels the most boring of all the freshwater eels I have kept. People seem to have varying experiences of them. I’ve heard about some that hand-feed, some that even eat flakes and others that chill on plants during the day. What’s more likely is that you will never see your spiny eel once introduced to a freshwater aquarium. 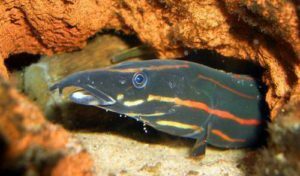 Many fish owners report that they simply forget that they have spiny eels until they clean out the entire tank and find them living an underground existence. The biggest problem I had with my Spiny Peacock Eel is that he didn’t eat ANYTHING. I have a freezer full of exotic fish foods that were all rejected. He got horrendously thin so I eventually put him in my guppy tank to chow down on some fry. He sadly got himself tangled in a decoration and died. I have been filled with guilt ever since getting a Spiny Peacock Eel. A Half Banded Spiny Eel is what a currently have in my main tank and is by far the best freshwater eel I have ever cared for. He is extremely active day and night, is tame, adventurous and simply a delight to have. He hangs on and in plants, inside a sea shell and tubes and even discovered a hole in my driftwood. Burrowing hasn’t been an issue (granted he is only about 8cm). He has a healthy appetite for bloodworms, whether been hand-fed them or otherwise. I would highly recommend Half Banded Spiny Eels over any other freshwater eel. Granted I have only kept these three types, but my experiences of them are incomparable.